WEST LAFAYETTE, Ind., LOGAN, Utah, & DURHAM, N.C., Nov. 7, 2013 — Nishant Mohan, Ph.D., has joined Wasatch Photonics Inc. as director of product management and marketing to develop and commercialize the next generation of the company's optical coherence tomography (OCT) spectrometers and systems, the company said Wednesday. Wasatch Photonics General Manager Mike Sullivan said that Mohan has more than a decade of experience with OCT.
"Nishant played a pioneering role in employing the technology for novel applications ranging from blood-flow estimation to contact lens imaging," Sullivan said. "His experience in academia and industry gives him an overarching perspective on this market. 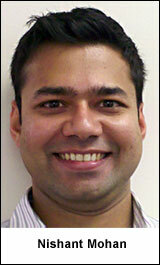 Nishant's technical and managerial expertise will help our company accelerate its product line." "This opportunity was a perfect fit for my vision of creating new applications for optical coherence tomography," said Mohan, who had previously been in research and development at Bausch + Lomb in Rochester, N.Y. Founded in 2002, Wasatch Photonics designs, manufactures and markets Raman spectrometers, OCT systems, enhanced holographic optics for optical networking, spectroscopy, test and measurement, and medical imaging applications based on its proprietary holographic recording media and Dickson grating technologies. Its Photonics System Div. is based in Durham, N.C., and it has a facility in the Purdue Research Park at Purdue University. The company was a finalist for a 2013 Prism Award for photonics innovation from Photonics Media and SPIE for its Stroker f/1.3 lens-based spectrograph.